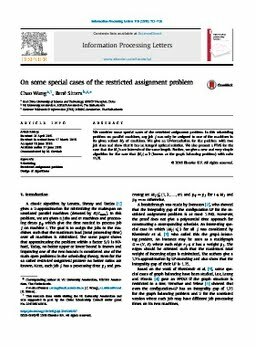 We consider some special cases of the restricted assignment problem. In this scheduling problem on parallel machines, any job j can only be assigned to one of the machines in its given subset Mj of machines. We give an LP-formulation for the problem with two job sizes and show that it has an integral optimal solution. We also present a PTAS for the case that the Mj's are intervals of the same length. Further, we give a new and very simple algorithm for the case that |Mj|=2 (known as the graph balancing problem) with ratio 11/6.